You must have seen automatic door openers in shopping malls and other commercial buildings. They open the door when someone comes near the entrance and close it after sometime. A number of technologies are available to make such kinds of systems like PIR sensors, Radar sensors, Laser sensors, Infrared sensors, etc. 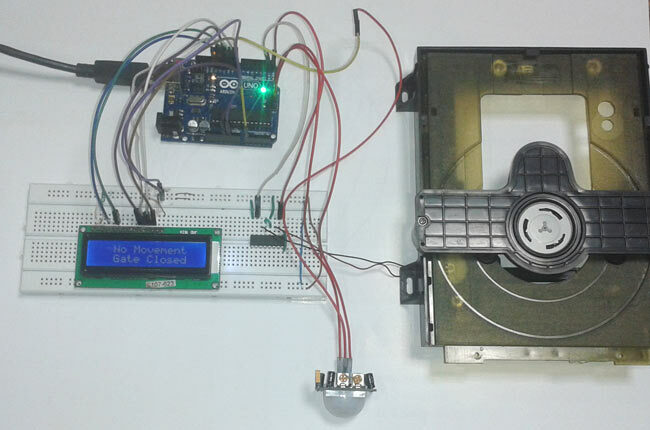 In this arduino based project, we have tried to replicate the same system by using a PIR sensor. It uses a motion-detecting sensor (PIR sensor) to open or close the door which detects the infrared energy omitted from human's body. When someone comes in front of the door, the infrared energy detected by the sensor changes and it triggers the sensor to open the door whenever someone approaches the door. The signal is further sent to arduino uno that controls the door. PIR sensor detects any change in heat, and whenever it detects any change, its output PIN becomes HIGH. They are also referred as Pyroelectric or IR motion sensors. The main component of PIR sensor is Pyroelectric sensor shown in figure (rectangular crystal behind the plastic cap). Along with BISS0001 ("Micro Power PIR Motion Detector IC"), some resistors, capacitors and other components used to build PIR sensor. BISS0001 IC take the input from sensor and does processing to make the output pin HIGH or LOW accordingly. Connections for arduino based door opener circuit are shown in the above diagram. Here a PIR sensor is used for sensing human motion which has three terminals Vcc, GND and Dout. Dout is directly connected to pin number 14 (A0) of arduino uno. A 16x2 LCD is used for displaying the status. RS, EN pins of LCD connected to 13 and 12 of arduino and data pins D0-D7 are connected to arduino digital pin numbers 11, 10, 9, 8. RW is directly connected to ground. L293D motor driver is connected to arduino pin 0 and 1 for opening and closing the gate. Here in circuit we have used a motor for gate. The concept used here for programming is very simple. In program we have only used digital input output. DigitalRead is used for reading output of PIR sensor. After that, if PIR sensor senses any motion then program sends an command to open gate, stop gate, closing gate and stop gate. See below the complete code for arduino based automatic door opener. it is very simple project .pls dont use aurdino board . just try to do with compactness and simple cost ,reliabled one . its is best project for ever. there is no need of LCD. we just add it here only for demonstration. Great job. I want to do this same project, so my questions are what programming language did you used and how were you able to put the code inside the ardino uno. I would really appreciate your help and guidance. Thanks. In order to write the code , you need to download arduino onto your computer . Go to the arduino official website and download it . then copy the code . can we use ir sensor instead of pir sensor?? yes, you can use IR sensor. What is this m11 and m12 stands for?? These are just the variable name, used to define PIN 0 and 1 of Arduino, you can use any name. how does the motor work?!!! check the code in void_loop() function, motor rotate in one direction to Open the gate and then rotate in another direction to Close the gate. Could you please enlarge a little on the type of motor you used? Geared, stepper, servo, etc., and also its specifications? You need to find out the two wires, which are connected to rotating motor of DVD tray. If I use ultrasonic sensor instead of PIR sensor,which parts should I change of the program? Also could you tell the kind of the motor used? can we use pins other than 0 and 1 for motor...because i need pin 0 and 1 to connect bluetooth module. You can check our Home automation projects to Interface Relay with Arduino, then connect DC motor to Relay. WHat type of motor have you used? And please tell me how to choose a motor to operate a door that is @kgs heavy. We have used DVD Trolley from the computer here, but you can use simple DC motor, attached to gate. You can choose the DC Motor accordingly and need to provide the power supply accordingly. how to encode those code? can we use ultrasonic sensor? You should use simple DC motors with the given code, servo and stepper wont work with this code. Also adjust the sensitivity of PIR sensor. You need to install Libraries for them in Proteus. How i connect wire and motor with CD drive ? CD Drive itself has the DC motor, you don't need to connect any additional motor. You need to find connections to this CD drive motor. There is no display in the lcd, how do the wirings work? If I connect with dc motor and battery,should I change the code?,and what's power supply use? This project already using a 9v Battery, and you can take power supply for motor from Arduino (connected to computer) or a 9v battery should work. can i replace cd case with the door(build manually) that connected with dc motor? is the code still the same? Yes, the code will remain the same. can i know how to design correctly this circuit diagram by using proteus..
You can use Relay to trigger High voltage AC motors. Learn about relay here. you need to find only two wires which leads to CD drives Motor. Sir I made this project but the sensor is not working. Door automatically opens after some delay. Plz solve this issue I've tried every possible solution. sir, your helping nature is fantastic and i really thank u for the project. i have a doubt sir... that.. which type of motors can i use instead of cd driver because i don't have it. What can i do to the code to stop the door from opening and closing when the sensor is still detecting? Schematic is already given the in Article, please check. Can I connect 2 sensors to the same pins and still perform as intended? This is so that the door can open from both sides. Its Motor Driver IC L293D. can this project configured to use from a browser? we are using PIR sensor, Arduino, cd disc drive for this project.will you please, help me how to connect because I tried it with LCD but couldn't complete this project. instead of PIR sensor, we will use bluetooth sensor because we will make a face detection application and then we will have to connect it with bluetooth. any suggestions? Wow nice idea, I think it is very much possible! But, what will you use to do face detection? If I were you i would use openCV with Arduino thorugh serial COM. How are you thinking to do it. in my project the the pir is not getting stable, the error occurs with pir is its sensitivity,in my case i have used arduino code to run pir but the pir is continious sensing the motion even when there is no movement ahead of the pir. How i can remove this erro?????? The problem could either be with the module or code. So check the module separelty by using an LED to it output pin and check if it is working properly then proceed with arduino. i want the code of this project in c language. please help me my motor keep move clockwise and anticlockwise non-stop is this code problem ? i want to implement this on LABVIEW plz suggest me..
which DC motor is connected (voltage)....??? If I change pir sensor to ir sensor.does code same???? hello, i was wondering where did you connect your power supply ? Just power your arduino with the programming cable and the whole project will be powered. If you want to use a battery then use a 9V battery with its negative to ground and positive to Vin.